I’ve taken it upon myself to learn, practice, and teach mindfulness to young people and adults. In so doing, I’ve kind of ruined my own life! While melodramatic, there’s a bit of truth to the statement. 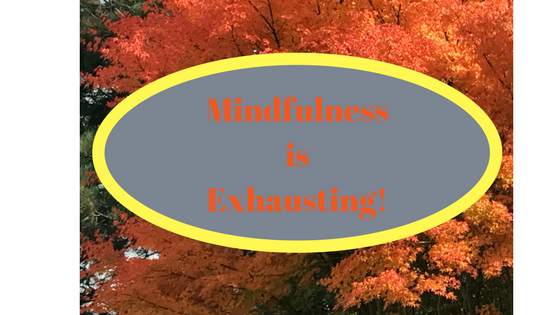 The act of concentrating and connecting to every single moment can be daunting and downright exhausting! Why can’t I just do the dishes and disconnect? Instead, I have to focus on the water rushing around my hands, the soap suds dripping slowly from the pan, and the sounds of the drain slurping. Enough already! I just want to do this and move on; why must I focus so intently on each second of my life? I tell people to do this, yet the practice of it as I work on being a mindfulness expert is depleting my own energy. The irony is that I preach mindfulness, and as I practice it, I’m changing because of it. Still, if only I can just be without concentrating so seriously on the art of being. So much of my energy is spent asking myself if I’m in the moment, instead of just being in the moment. I’m pulling myself out of my own life by reminding myself to constantly concentrate on it. It’s perplexing. I feel this ever-growing pressure to be the most mindful person who ever walked the earth. I’m a leader, guiding meditation, and so I’ve got to have this mindfulness thing sorted, right? I’m constantly putting so much pressure on myself while conversing with people – are you really listening? Ironically, because I’m questioning myself about being in the moment, I’m not even in the moment with this person. I find myself, in my pressure to be present, losing my ability to truly listen to someone else. When eating, I prod myself, can you really, really taste the food? Are you really here? SO MUCH PRESSURE! Why can’t I just zone out for once? What’s so great about connecting with the leaf falling from the tree as I’m out for a walk? Must I notice everything to be mindful? Can I let my thoughts happen and not completely immerse myself in the minutia of every single, mother loving moment? Consistently being so damn awake in my life is sapping my energy. Yet, it’s what I ask of others. I tell them that connecting to the moment, to our lives, is all that we have. Yet, focusing on each second can be exhausting. So, the lesson here is – let’s give ourselves some slack. Let’s allow ourselves some mindlessness so that we can lighten our spirits. Easing up a bit isn’t the worst thing we can do for ourselves. Cause, let’s face it, every single second is not worth our unwavering focus. Sure, mindfulness and checking in with ourselves is vital to our lives and our work; but maybe it’s time to take it a bit easier. As I write this I find myself letting go and am giving myself permission to do so. I’ll have to remember this as I move through my days, allowing that leaf to fall from the tree without completely becoming the leaf. I TOTALLY relate to this. Our minds will eventually invoke more complex thought in order to move through life, interact and grow. While in a mindful state, I can’t quite erase a vague awareness of existing, harmful thought distortions that are unresolved, and negatively affect my well-being. This, paired with the understanding that mindful states are temporary, makes me feel there is still more exploration to be done regarding the benefits of recommending mindfulness practices to people in psychological distress. Agreed Katie! In fact, mindfulness might not be the answer for people who are in distress. For example, closing one’s eyes and breathing can be traumatizing for many people who are suffering. There are ways to incorporate mindfulness into therapy, but one’s therapist, along with medications (if required) should be used in tandem with a gentle mindfulness practice. Hello! I totally agree on this!! I started meditating almost one year ago and during a period I started doing meditation sessions very frequently, like 30 mins per day at least. After some days I started feeling weird because I was always going too observe and see my mind and my thoughts… I was asking myself “do I have to stay in the moment every single moment in my day?”… and after this I was asking to myself continously the question “what am I thinking?” or continously observe what I was thinking… now this problem hasn’t gone yet.. I continously observe my mind and observe my thoughts during the day.. I’m very nervous about this thing and it’s starting to ruin my life and I have no idea how to solve it.. I m going to a psychoterapist and it’s helping but I’d like to know if maybe you have had this problem or similar… how can I solve my problem in your opinion? I obviously stopped meditating at all. I’m very depressed and with no hope… thank you! !